It is a USB type LAN adapter that can connect the SWITCH main unit to the Internet via a wired LAN. You can enjoy network-ready games comfortably without worrying about communication disconnection or delay that is likely to occur in Wi-Fi connection. It corresponds also to a personal computer not equipped with a wired LAN port (corresponding OS: Windows 7/8/10). 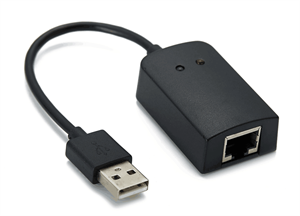 Easy to use just by connecting to the USB port of the PC, installation of driver software etc is also unnecessary.